Title : Guess Who's Coming to Die? Rather slow and boring in parts had to push myself to finish. 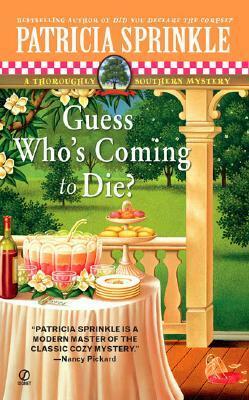 A southern woman mystery, so very different to my world and the characters I did not relate to at all. This series is getting old quick! Love this series. Wish Patricia Sprinkle would write more of them, but I think she's finished. I really enjoy the adventures of McLaren and her family. A little slow but still a fun read. This was a funny read. Mac gets herself into a bit of trouble as everyone at the club she just joined is under suspicion of murder of the president of the club. Very fun series. I enjoy the strong Southern women and their strong Southern families. The mysteries are nicely plotted and the gardens are simply marvelous. The "A Thoroughly Southern Mystery" series is thoroughly enjoyable and #9 is continues with charm, wit, tradition, and intrigue. Another good mystery and I thought the ending was really good. Patricia Sprinkle - Aka Patricia Houck Sprinkle.When I met and married Bob, he looked over our budget and demanded, "Why don’t you write a mystery to pay for all the ones you buy?" I immediately knew I wanted to put a body in a building where I’d once worked. However, being over-endowed with the Protestant ethic, I wrote "important" things first and only wrote the mystery in my spare time, so my first mystery, Murder at Markham (reissued by Silver Dagger in 2001), took thirteen years to complete. It took even longer for me to learn that any writing which gives me pleasure is important, whether fiction or non-fiction.Since 1988 I have written twenty mysteries, four novels, and five non-fiction books. I am grateful to my readers and editors for letting me do what I enjoy most in the world. Bob has concluded that writing is not a profession, it's an obsession--my favorite vacation is to go to a place where somebody else fixes my meals and where I can write more than I do at home, without interruptions. Thanks, if you are one of the readers who keeps my fingers on the keys. I enjoy spending time with you at conferences, book clubs, and signing events.